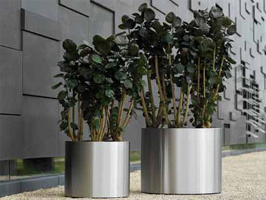 Superline Stainless Steel Planters from Ora Home Ora Home Ltd. 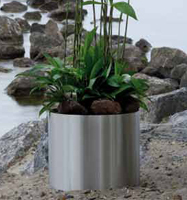 The stainless steel planters in the Superline collection are dazzlingly beautiful. Their stylish design sets exactly the tone you are looking for without deafeningly screaming for attention. Pioneering, relaxing, inviting and chic: a 100% Dutch design, with certified stainless steel crafted into traditional designs using skills that date back centuries. Every planter passes through no less than ten pairs of skilled and experienced hands during the process of cutting, rolling, welding, coating and polishing. Here, traditional crafts perfectly combine with modern technology to create a stylish interior and exterior. The result is a perfect planter with a character that will enrich any setting you place it in. It is a high-quality planting solution with a radiant shine that reflects the colours and atmosphere of its surroundings. 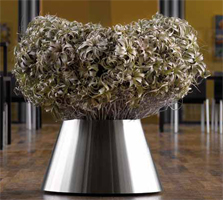 A Superline planter highlights your individuality. Itâ€™s amazing how much life a perfect stainless steel surface can bring to a room. The Superline full stainless steel collection consists of various large and small works of art in a variety of exquisite designs. Gaze with amazement and draw inspiration from the stunning effects created by the square, round,Â square-conical and round-conical series. We also offer a range of special designs, such as plinth models. The planters radiate class and charm without imposing themselves on their surroundings. Furthermore, a wonderful variety of frames, exquisite wood veneers and wheel bases are available. The super-coating on the interior guarantees a watertight finish. The smooth, dirt-resistant exterior is available in any colour. And soon, Superline stainless steel will be available in custom designs, allowing you to let your imagination run wild! For example, you can extend the stainless steel to combine with objects such as reception desks, seats, wall panelling and railings. As the design and production is all conducted in-house, you never have to wait for long. Superline stainless steel inspires you to take that extra step. 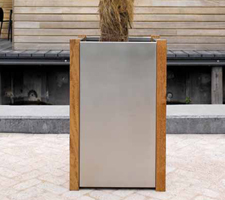 Superline hybrids create a charming interplay between stainless steel and other materials. By making beautiful combinations of materials and special finishes, you can add your own personal touches to create a luxurious and welcoming atmosphere. These fabulous designs, which use materials such as FSC wood, create a warm and natural ambiance. They blend naturally into plant-rich surroundings, and add a touch of elegance to formal settings. Superline Cortensteel is characterised by a dynamic dark-brown colour scheme. This alloy, consisting of, amongst others, iron, copper and chrome, is a favourite material for statues and other works of art. The robust quality is oxidised in a sustainable, colour-fast and rust-free manner according to an authentic process. An optional protective layer of oil is also available. The high-quality interior coating prevents rusting from the inside. It is an artistic choice that testifies to your good taste. We have over 60 products in our Superline Planters range.